While my family and I currently reside in Massachusetts, I grew up trout fishing with my father at a young age in both New Jersey and Rhode Island. As far back as I can recall I have always been fascinated with fishing and chasing trout. Like many young fisherman who began fishing with bait and a bobber, I later moved on to spin fishing until I learned to share my father’s love for fly-fishing for trout in my teens and early twenties. My father remains the most talented all around fly-fisherman and caster I know and I consider myself fortunate to still enjoy many regular fly-fishing adventures with him and his fishing buddies who have grown greatly in number now that he has retired. Both my father and I are avid readers and together we have amassed a good sized collection of books on the subject of fly-fishing that I can regularly turn to in order to further my own education and love of our sport. 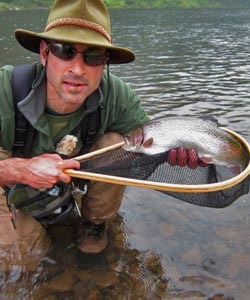 During the long Winter months, I very much enjoy reading and rereading certain chapters in fishing books in order to fully understand various tactics and methods of trout fishing as practiced by masters of our sport such as the late Sylvester Nemes or the prolific authors and wet fly experts Dave Hughes and Roger Fogg to name but a few. As a part-time trout fishing guide, I am also an active member of two different fishing clubs/organizations: Trout Unlimited and Crossroads Anglers. All three afford me the opportunity to further my love of the sport. I regularly tie my soft-hackle wet flies at regional fly-fishing shows such as the Bear’s Den Fly-fishing show each Winter and I also enjoy teaching others how to tie and fish my flies. I must admit, that I never get tired of seeing the expression on people’s faces or hearing the stories of how one of my hand tied soft-hackle flies helped a fisherman to fool a trout. This soft-hackled wet fly pattern is a classic North Country Spider that is based on those tied in the United Kingdom and which has also proven itself deadly on American waters with American trout over a period of many years. In addition, this particular pattern was one of the late Sylvester Nemes' (the self-professed soft-hackle addict's) favorite patterns and is a must have in every fly-fisherman's fly box. This soft-hackled wet fly pattern is a classic North Country Spider that is based on those tied in the United Kingdom and which has also proven itself deadly on American waters with American trout over a period of many years.